When you come to the new restaurant, first you discover the food. Then drinks and wine. Then ambiance and decor. Then service. Well, yes, all of the above – but in the random order. The experience is somewhat like peeling the onion, only with an element of surprise – you don’t know what your next excitement will be. May be a new dish. Or may be, as I recently had, a creative interior which all of a sudden dawns on you, after you already spent more than hour in the restaurant. 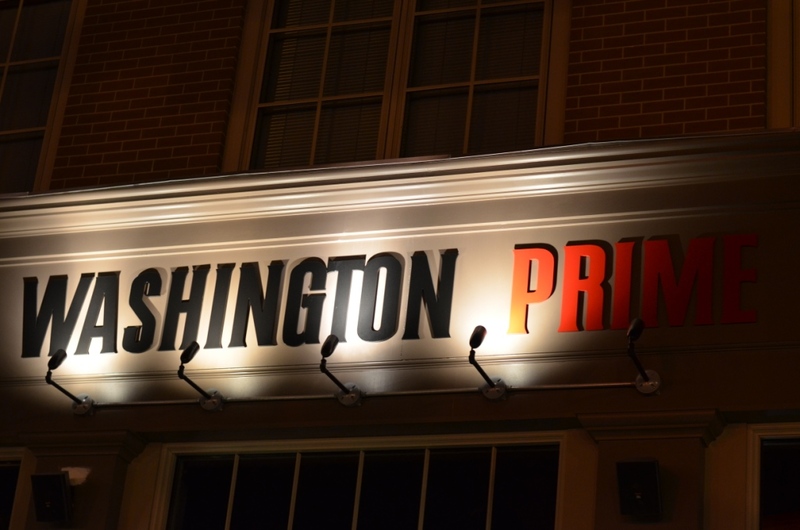 About two weeks ago, we visited new restaurant in Norwalk, Connecticut, called Washington Prime. The restaurant is located on the Washington Street, hence the first part of the name. And for the second part, there can be multiple explanations, but as restaurant is a steakhouse, and it serves only Prime cuts of beef (for the readers outside of the US – Prime is a definition from the US Department of Agriculture for the best quality selection of beef), hence the second part of the name. We walked into the restaurant, immediately got to our table, and started studying the cocktail selection and got into the conversation with our dining companions. Only an hour into our dinner I had an opportunity to walk around and see how creatively the dining room was decorated, with the grape vines on the ceiling above bar and green plants (yes, artificial, not live) covering the walls in the corridor. It became quire dark when I made the discovery, so the pictures wouldn’t do a justice to the decor, but nevertheless, you will get an idea. The cocktail list was quite interesting, and it was not easy to make a selection. I went with the Basil Smash (basil, simple syrup, tanqueray 10, lemon just) – nicely refreshing and not overly sweet. Moscow Mule‘s presentation also looked quite interesting. Then, of course, we went for the wine. The wine list overall was interesting and well composed – but it was not easy to make a selection as I always go out of my way looking for value, and it was simply not that easy (lots of selections were priced at about triple retail, and you know that I have a problem with that). For the white, we had a 2012 Martín Códax Albariño, Rias Baixas – simple, food friendly wine with clean acidity and touch of white stone fruit. We also had 2013 Jean-Luc Colombo Cape Bleue Rosé Provence, which was light and loaded with strawberries.For the reds, we started with the 2012 David Bynum Jane’s Vineyard Pinot Noir Russian River Valley – young, smokey, light cherry flavor, good acidity. While this was a nice wine, we felt that it wouldn’t really stand up to our dinner which included steak, so the red wine we chose to stay with until the end of the meal was 2011 Ridge Three Valleys Sonoma County – notes of smokey raspberries, espresso, touch of dark chocolate, all weaved together over a firm structure with some earthy notes – excellent overall. And now let’s talk about the food. Everything was split into the courses. We started with a few appetizers – Seafood Tower (colossal shrimp, local oysters, little necks, Alaskan king crab leg, Maine lobster, spicy mustard, house cocktail sauce, classic mignionette) and House Slab Bacon (smoked, thick-cut). The bacon more resembled the pork belly than traditional bacon, and literally was melting in your mouth. The Seafood tower was excellent, great selection of fresh oysters and clams. Our dinner continued with Small Plates. Lobster Bisque (parsley, crème fraische) was very concentrated, with nice flavor. Deviled Eggs (creamy yolk, prime meatball, pickled onions, foie gras powder) were unsuccessful, unfortunately. I love deviled eggs, one of my childhood favorite dishes – and we keep making it almost for each and every party. The deviled eggs served at Washington Prime were way too acidic, with pickled onion been just too much. I think this dish requires some work make it a success. Burrata (creamy slaw, sambal aioli, sesame, pretzel bread) was creamy and satisfying, just as you would expect the Burrata to be. Poutine (oxtail ragu, house fries, cheese curds, green onions) was an interesting dish. The oxtail ragu was outstanding, with the flavor and texture creating irresistible, homey experience . However, the cheese curd didn’t fully integrate into the dish – at least with my memories of Poutine in Quebec. Knuckle & Claw (blue cork grits, lobster sauce, tobiko) was okay – yes, I’m not really a big fun of lobster, so the blue corn grits and tobiko were the best components of the dish for me. Octopus (pickled peppers, duck fat marble potato, pepper emulsion) was to die for. Perfectly cooked, with delicious flavor combination, it was definitely a star dish. Wings (fried, kimchi sauce, scallions, soy, chilli) were crispy and very tasty (could use a bit less salt). Finally (after about an hour of eating), the time had come for Salads. First, Prime Wedge (gem iceberg, pickled heirloom tomatoes, bacon, ewes blue cheese, chili, house ranch dressing) was spectacular. I love the Wedge, and I order it quite often – this was the very best Wedge salad I ever had – the bacon, the sauce, the sweetness of the lettuce were just spot on. And our next salad dish, Chop Chop Salad (iceberg and romaine, bell peppers, onion, carrot, provolone, salami, red wine vinaigrette) was also very much on par with the Wedge – fresh, light and delicious, with the very tasty sauce. And the time had come for Land & Sea. We were in a steakhouse, so of course there was steak! USDA Prime Steaks – 8 oz filet Mignon, 18 oz Ribeye, 32 oz. Porterhouse (dry aged 28 days) – were all served on the beautiful wooden boards, in its perfectly simple beauty. The selection of steak sauces, which also included spicy mayo and Chimichurri, was served on the side. The steaks were just outstanding, all three of them had a slight difference in texture and flavor, but they were all simply done at the “wow” level. Representing the “sea” part, first we had Grouper (Carolina gold rice, tomato, asparagus, carrot butter sauce) – if the steak was “wow” dish, this was a double “wow”. I know that expression “melting in your mouth” is abused, nevertheless, this is the only way I can describe this dish – great flavor, and the fish was really melting in the mouth… And then there were Scallops (middlins, corn relish, nicoise olives, hunters sauce), my perennial favorite, done at the textbook quality – “perfectly seared, succulent and sweet” – the best way possible. 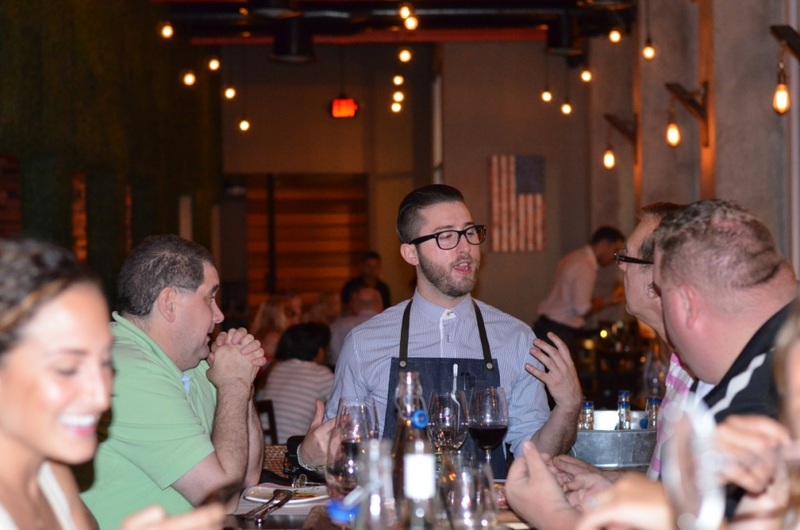 Executive Chef Jared Falco came out to check on us many times, and we had an opportunity to discuss the dishes and his approach to making his cooking stand out. All in all, we had a great time. That’s all I have for you, my friends. Yes, we had a great evening of food and wine, and the restaurant is definitely worth a visit if you are in a mood for steak, or simply a creative bite of food. Oh yes, and I meant to warn you not to read this post hungry – I guess it is too late now, sorry. Cheers! I visited restaurant as a guest of the management. All opinions are my own. Located at the corner of Washington and Water St.